Numerous bacterial transcription regulatory proteins bind DNA via a helix-turn-helix (HTH) motif. These proteins are very diverse, but for convenience may be grouped into subfamilies on the basis of sequence similarity. 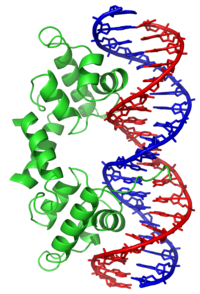 One such family, the lysR family, groups together a range of proteins, including ampR, catM, catR, cynR, cysB, gltC, iciA, ilvY, irgB, lysR, metR, mkaC, mleR, nahR, nhaR, nodD, nolR, oxyR, pssR, rbcR, syrM, tcbR, tfdS and trpI [PUBMED:1907267, PUBMED:1592818, PUBMED:1840615, PUBMED:3413113, PUBMED:2034653]. The majority of these proteins appear to be transcription activators and most are known to negatively regulate their own expression. All possess a potential HTH DNA-binding motif towards their N-termini. For those sequences which have a structure in the Protein DataBank, we use the mapping between UniProt, PDB and Pfam coordinate systems from the PDBe group, to allow us to map Pfam domains onto UniProt sequences and three-dimensional protein structures. The table below shows the structures on which the HTH_1 domain has been found. There are 89 instances of this domain found in the PDB. Note that there may be multiple copies of the domain in a single PDB structure, since many structures contain multiple copies of the same protein sequence.